Doesn't this dress remind you a wee bit of Rainbow Brite? I know, it's not even a mini, but the stripes and the different colors sure bring back some fun childhood memories! I wore this dress last Sunday, which was spent hanging out with the family. 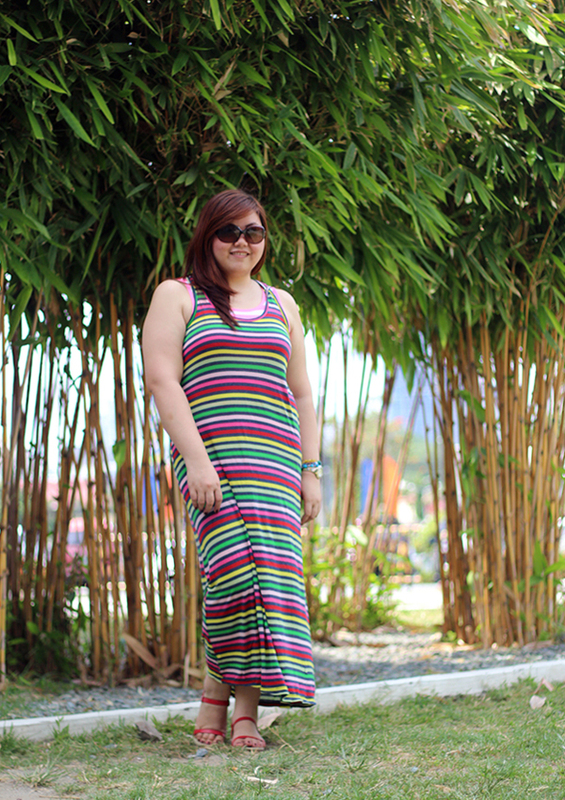 It's colorful, bright and stripey-- something that hardly escapes the eye. Plus, dressing in a cotton maxi dress gives off a carefree vacation vibe that's perfectly apt for summer. I think this style has been called by many names, but I prefer, "lazy dressing." This would've looked a lot better with a belt but it wouldn't be called lazy now would it? Here's a quick how-to. Find a no-brainer kind of dress in a soft, comfortable fabric, bring it over your head and voila! You're done. Just remember that the biggest hole is for the head. I still get confused sometimes. What are your go-to clothes when you're feeling lazy? 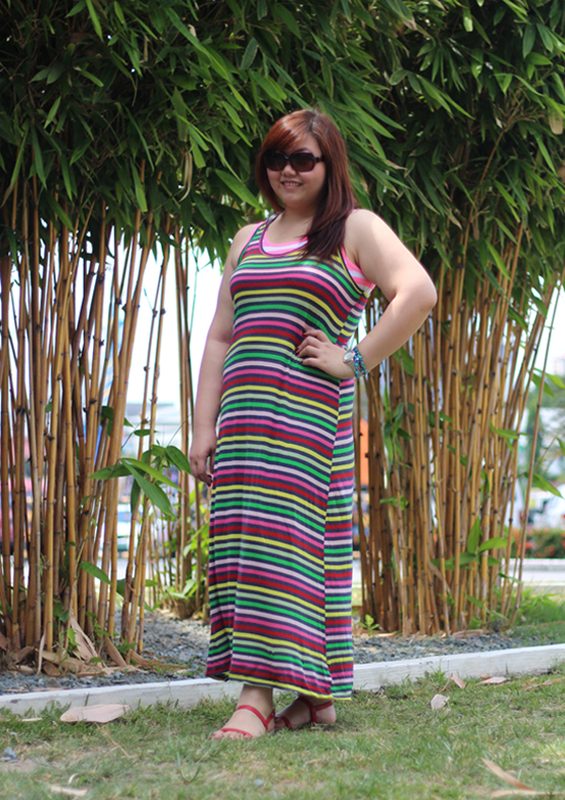 Ever the rainbow of awesomeness... very cool maxi dress along with a nice pair of sandals. This is just easy and effortless style. I like it! My go to clothes are defiantly my dungaree shorts - which I am wearing right now! I'm pretty much a jeans and tee kinda gal when I'm feeling lazy, though a maxi is always perfect for just throwing on and looking utterly effortlessly chic! I often go for the jeans and tee combo too. Yan ang lazy dressing! May bloggers kasi who claim "lazy dressing" pero halatang pinag-isipan. Hahaha! Anyway, I love rainbow colors! Very bright and you sure looked comfy. 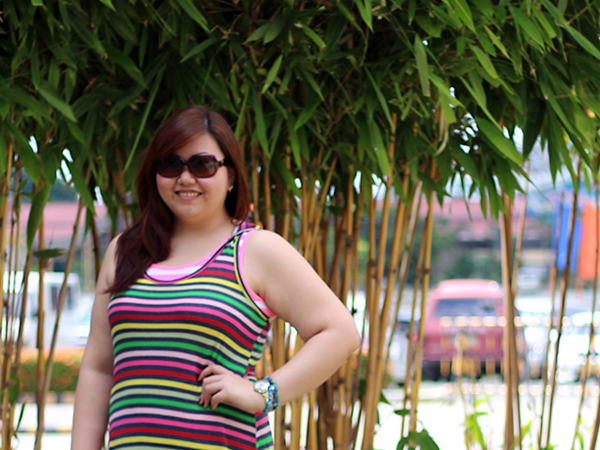 May inner tank top (white-and-pink stripes) ka, yes? Haha! This one's pang-tamad talaga! Yes, may inner tank kasi the dress has a slightly racerback design and I couldn't find the right bra for it. LOL!